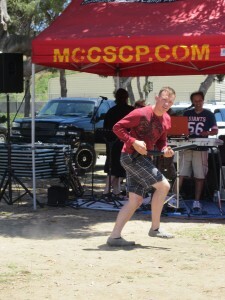 It was our extreme pleasure to host the annual Family Day for the 11th Marines at Camp Pendleton, California. A ton of activities, games, and amusements combined with excellent weather made for a great turnout, with more than 600 guests—Marines with their spouses and children. For the kids, we provided pony rides, a petting zoo, face painting, balloon art, and—new this year—a bead station, where tiny fashionistas designed their own jewelry. The bounce house, guarded securely by two uniformed Marines, and obstacle course were quite popular as well. And the pièce de résistance … a massive inflatable jousting ring was enjoyed by kids and soldiers alike. The amusing tradition at Family Day in years past has been the sumo wrestling competition. Once again, Marines donned enormous padded “sumo” suits and sumo-wrestler hair helmets to enter the arena. (The spectacle is almost impossible to describe; you must see the photos!) Often the Marines waiting their turn in line couldn’t help themselves and would sporadically tackle unsuspecting “sumos,” who could hardly move in their portly costumes. And the chow was phenomenal! Barbeque fixings with pulled pork, chicken, mac and cheese, potato salad, cole slaw, and super fresh fruit. For dessert, it was snow cones or a trip to the customizable cupcake station, where one would choose their cake flavor, frosting, and pick from a variety of candy and other toppings. Saddleback Church sent a band, so there was live music throughout the day. This was interspersed by various dance, music, and singing competitions, of which the air guitar contest was the hit. Former Navy Region Southwest Command Master Chief Craig Morey, a dear friend of Freedom Alliance, handcrafted a patriotic electric guitar and donated it for Family Day. 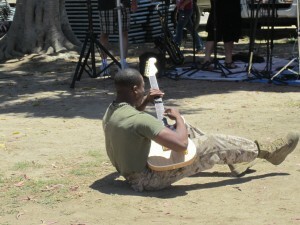 The Marines competed fiercely for this grand-prize guitar. The showmanship was extreme—intense expressions, rock-star moves, tricky finger work, and even rolling in the dirt to win the crowd. (Again, please see the photos below.) Corporal Justin O’Donnell was an absolute sweaty, dusty mess by the end of his performance … but sometimes victory is dirty, as any Marine will tell you. Justin’s look was one of pure elation when he was announced the winner. 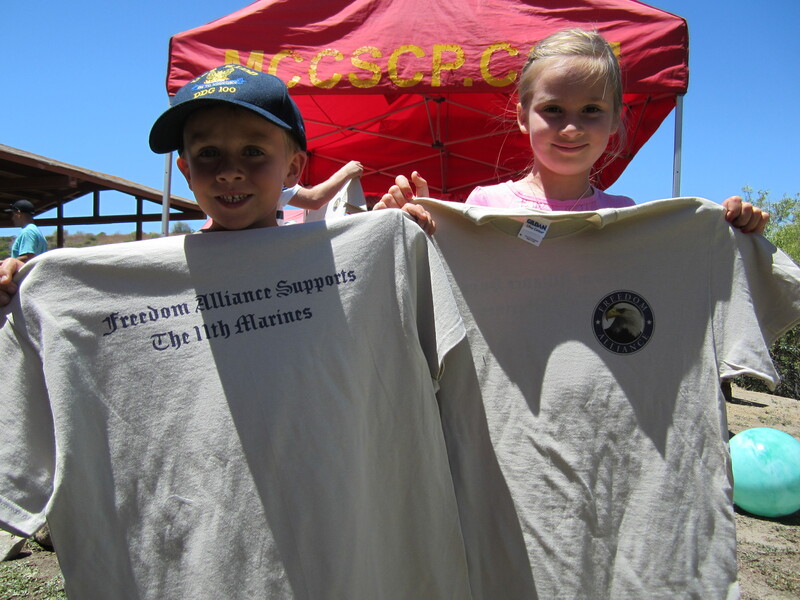 The giveaways this year were t-shirts printed with our logo on the front and “Freedom Alliance Supports the 11th Marines” lettered on the back. Raffle prizes were available as well: spa days, bicycles, baseball tickets, amusement park passes, and more. A mini-guitar went to the first-place winner of the children’s air guitar competition. It was truly a special day. Whether a soldier was getting ready to deploy, exhausted from having just returned, or dutifully putting in a soldier’s daily work, these Marines were thrilled to spend a fun, relaxed day with their families.